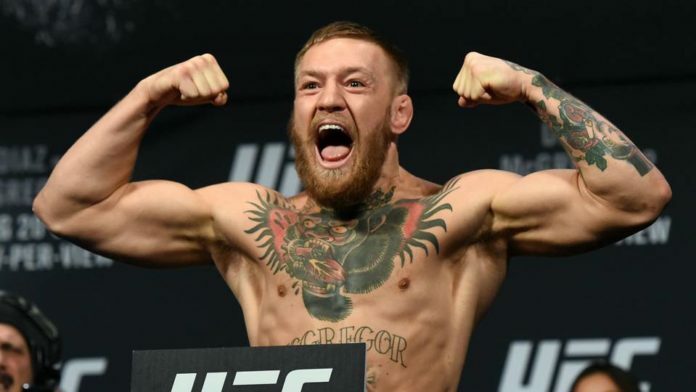 Conor McGregor says that he’s staying in shape and ready for a return to the UFC in July but negotiations are ongoing for a time, place and opponent for his next fight. Conor McGregor is staying ready to fight even as negotiations continue for his return to the UFC later this year. According to the former two-division champion, talks have started for his next fight but it appears there are still some roadblacks that need to be moved out of the way before he can officially announce his return. McGregor last fought in October 2018 when he fell to Khabib Nurmagomedov by fourth round submission at UFC 229. There have been several rumored opponents for McGregor’s next fight but it doesn’t appear anything has been booked just yet. “My next fight, we’re in talks for July,” McGregor revealed on “The Tonight Show” on Monday. “We’re in talks for July so we’ll see what happens. A lot of politics going on. The fight game is a mad game but as I said again, to my fans I am in shape and I am ready. Not that long ago it appeared McGregor was targeting a showdown against Donald “Cowboy” Cerrone but that fight fell apart after the UFC apparently wanted them to serve as the co-main event on a card. McGregor, who is by far the biggest draw in the history of the sport reportedly scoffed at that idea considering the fanfare that surrounds his contests whether he’s competing for a title or not. In fact, two of the biggest UFC pay-per-views of all time were headlined by McGregor in non-title fights (his two contests against Nate Diaz in 2016). There have also been rumors that the UFC could consider a third fight between McGregor and Diaz or potentially a matchup against Anthony “Showtime” Pettis after he expressed interest in that fight after knocking out Stephen “Wonderboy” Thompson this past weekend. Whoever it is, McGregor sounds like he’s ready to resume his career assuming he can come to terms with the UFC on a date and location for his fight. McGregor makes it clear that he’s doing this for the passion of fighting rather than the money because by those standards, he never has to compete again. “I’ve done a lot, I’ve fought a lot, I never pull out of contests, I’ve gone through some crazy injuries and crazy external situations that many a man would sprint for the hills if it happened to them,” McGregor said. “I stood firm and done my piece for the company so I am in a position now like this whiskey is my baby, I’ve got a lot of great entities.